metal cigarette case with map of Ireland embossed . Made in England ,looks like stainless steel . Has a couple of marks . Dispatched with Royal Mail 2nd Class. The tape is NOT included in the sale . Note: Manufacturers reserves the right to change specifications of parts and accessories without notice. Specifications and standard accessories may vary from country to country or distributor to distributor. Honestly as I can. This does have wear and a patch has peeled off. Here we have cigarette case engraved with map of Berlin showing the city divided up by the Allied forces after WW2. Works ok in that the lock and hinges work. Any value lies in interest in the subject. Antique Cigarette Case, Map Of India/Asia Design, 50 Years Old Working spring hinge, map of India on the front, machine work detailing on the reverse, at least 50 years old, weighs 120g, great condition considering it’s age. vintage cigarette case map of wales. Condition is Used. Dispatched with Royal Mail 2nd Class. 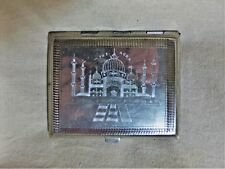 Unusual silver tone cigarette case.Engraved with map of India on front and Taj Mahal on back. Leather bound on both sides and gilt finish inside. Vintage Metal Nederland France and Luxembourg and (allemagne) Map Cigarette Case. Measuring 11cm by 8cm, made for filterless cigarettes, machined and chromed exterior, with map of Nederlands, with gilded interior, and gold elasticated straps. Condition still good, some but please check photos. New listingVINTAGE EMU CIGARETTE CASE Turned Chrome Great Britain & Northern Ireland Map. Great Britain & Northern Ireland Map to the Face. Pictures taken in Natural Light. In Very Good Condition. MADE IN ENGLAND. Bottom left corner stamped: DIT IS DI VOOTREKKER PATH translates This is the Voortrekker path. Right Hand side bottom corner: Engraved initials CB. STAMPED 'TALLENT ENGLAND' ON THE INSIDE EDGE. WITH A MAP OF AFRICA ON ONE SIDE AND CAPE PENINSULA ON THE OTHER. A VERY UNUSAUL CIGARETTE CASE. Still a great case to hold cigarettes. We will work with you. In very good used condition. PICTURES ARE OF ACTUAL ITEM. I have tried to make them as clear as possible. Map of Jersey on the front and very good condition. Vintage Emu brand cigarette case - chrome, measures 13cm x 8.5cm. Condition is used, with some signs of age inside, but outside is mostly well kept. Design depicts Great Britain and Northern Ireland map with multiple place names, and a circular area which could be engraved/initialised? It has a spring loaded fastener push button fastener that is fully working. VINTAGE EMU CIGARETTE CASE Turned Chrome Great Britain & Northern Ireland Map. VINTAGE EMU CIGARETTE CASE Turned Chrome Great Britain & Northern Ireland Map.. Condition is Used. Dispatched with Royal Mail 1st Class signed for . THE DESIGN FOR THIS CASE IS: Neverland DESIGN 01. THE COLOR OF THIS CASE IS SILVER. CUSTOMIZATION IS MADE IN THE USA. Map of West Country on front. In good used condition for age - Not sure of exact date, but I would guess circa 1970's. There are signs of wear, scratches, cracking to material. A VERY NICE POLO MAKE CIGARETTE CASE WITH AMAP OF ENGLAND. GREAT LOOKING PIECE. A STUNNING LOOK. UNUSUAL DESIGN. GETTING HARD TO FIND. This is not a cheap stick on photo, this is superior high quality artwork. THE COLOR OF THIS CASE IS SILVER. It is a double sided case holding 16 king size or 100's cigarettes. THIS CASE IS CUSTOMIZED. THE COLOR OF THIS CASE IS SILVER. THIS ITEM IS MADE IN THE USA. THE CUSTOMIZATION ON THIS ITEM IS DONE BY PERFECTIONINSTYLE. A very interesting historic collector's piece. Cigarette cases are either filtered kingsize or 100mm. Each sturdy case is hand assembled, coated with a durable lacquer finish for years of continual use.
. my cigarette cases are all handmade and finished with a high quality printed image.a perfect and affordable gift for any occasion, with so many designs to choose from. 9x8x2cm and will hold up to 20 Cigarettes. Product: Antique Australian Cigarette case. Material: PorcelaGilt Lined. Category: Antique. Notes: Nice collection.